GASTRONOMY by Joy: Gastronomic Treats for Moms' Day! Gastronomic Treats for Moms' Day! "Motherhood brings as much joy as ever, but it still brings boredom, exhaustion, and sorrow too. Nothing else ever will make you as happy or as sad, as proud or as tired, for nothing is quite as hard as helping a person develop his own individuality especially while you struggle to keep your own." That is according to Marguerite Kelly and Elia Parsons. We owe our lives and success to our mother's. All over the world it is celebrated, however obscure the date is or when and how the celebration began, what trully matter is we took 1 day in the 365 calendar days and give it mom. but this day, May 8, should be special. Don't you think she deserves to be happy and thankful for being your mom? 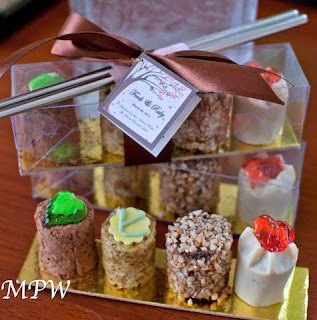 Here are cool gastronomic treats for mom on Mother's Day! Fruiquet has great and unique ideas that will surely make your Mom's eyes sparkle. My Pink Wasabi can capture mom's heart in these inviting sweet delights. 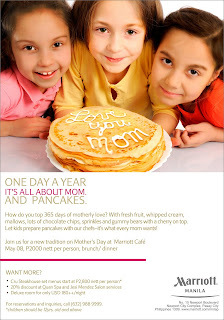 Marriott Hotel Manila whips up pancakes and have kids meticulously design their flapjacks for their moms.For inquiries or reservations, call 988-9999. Drop by Powerplant for activities with mom and buy her something special, some shops are having sales. 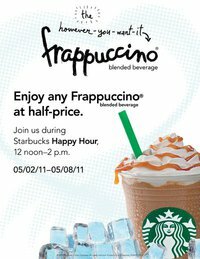 And bring her to Starbucks for a refreshing Frappuccino with just half the price.